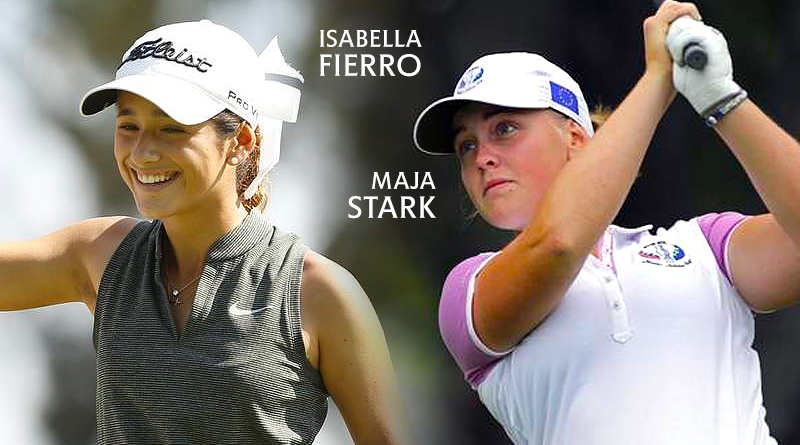 Incoming Oklahoma State women’s golfers Isabella Fierro and Maja Stark and current University of Oklahoma golfer Julienne Soo were among the 72 golfers selected across the globe to compete in the inaugural Augusta National Women’s Amateur on April 3-6. Gathering the week before the Masters Tournament in April, the international field of the top 72 amateur golfers on the planet will compete over 54 holes of stroke play, with a cut to 30 players taking place after 36 holes. Fierro and Stark, who signed with the Cowgirl golf program in November, are two of the most highly touted signees in program history, and will arrive on campus in August. Fierro, the No. 35 ranked amateur golfer in the world, is coming off a season that saw her win the Mexican Amateur Championship in Mexico City, the South American Amateur in Buenos Aires, Argentina, and the North & South Women’s Amateur Championship in Pinehurst, North Carolina. Stark is ranked the No. 38 amateur in the world, and recently finished seventh at the World Junior Girls Championship in September in Ottawa, Canada. She was one of 12 players chosen to represent Europe in the PING Junior Solheim Cup, and as a member of the Swedish National Team, where she helped her home country win gold at the European Ladies Team Championship this past summer. Gathering the week before The Masters, 72 of the world’s best amateur women’s golfers will compete over 54 holes of stroke play. The first two rounds will take place on the Island and Bluff nines at Champions Retreat Golf Club Wednesday, April 3 and Thursday, April 4. Following the second round, the field will be cut to the top 30 competitors. The entire field will then play Augusta National for an official practice round Friday, April 5. The final round will take place at Augusta National on Saturday, April 6 and will feature the competitors who made the cut. Soo qualified to receive the invitation by being ranked No. 66 in the World Amateur Golf Ranking. Entering her final semester as a student-athlete at Oklahoma, Soo boasts 10 career top-10 finishes with the Sooners. A 2018 Golfweek All-American Team Honorable Mention, Soo finished her junior season with a stroke average of 72.27 – tied with Chirapat Jao-Javanil’s 2012-13 campaign as the lowest in program history. Soo claimed 19th place in the NCAA Championships last spring. In four tournaments this season, Soo holds a stroke average of 72.08 along with two top-10 finishes. Over OU’s winter break, Soo returned to her home country of Australia and claimed second place in the Australian Masters in Melbourne. “We’re all so excited for Jules,” said OU head coach Veronique Drouin-Luttrell. “This is such an incredible opportunity for her. She’s worked really hard to be where she is now and we’re thrilled that it has paid off in an invitation to the most exclusive amateur tournament in the world. NBC Sports will produce and broadcast three hours (11 a.m. – 2 p.m. CT) of live final-round coverage of the event at Augusta National. Golf Channel will deliver on-site highlights, live reports and news coverage throughout the event. Additionally, Golf Channel’s “Live From the Masters” will commence on Friday, April 5 at Augusta National to provide coverage of the Augusta National Women’s Amateur, the Drive, Chip and Putt National Finals and the Masters Tournament. ← Oklahoma Golf Expo this Friday-Saturday, get your tickets now!